I saw a bumper sticker here in California that read JOE OLIVER IS STILL KING. I might take issue with that, since Papa Joe has many heirs, including that young man from back o’town, but I understand the sentiment. I know other bands are playing these tunes — somewhere, even as my fingers race across the keyboard — but no band sounds like the Stompers. The Stompers are Conal Fowkes, piano; John Gill, banjo, leader, vocal; Clint Baker, tuba; Kevin Dorn, drums; Leon Oakley, cornet; Duke Heitger, trumpet; Orange Kellin, clarinet; Tom Bartlett, trombone. And this is how they looked and sounded on November 27, 2014, at the San Diego Jazz Fest, playing three Oliver-associated songs. Beautifully. Some band. Long may they Stomp! Spike Wilner, pianist, clubowner, and a true Disciple of Swing, has another bold idea: a new New York City jazz club that presents genuine improvised music in kind settings. The club is a “piano room,” which is a term that needs a little explanation. I don’t mean a “piano bar,” where people accost the pianist at close range and insist (s)he play songs whose title they half know, or where sing-alongs explode like small wildfires — with much the same result. No. Spike has named the club for one of his musical heroes, the clarinetist / saxophonist / organizer / man with plans Milton “Mezz” Mezzrow. Mezzrow was a fascinating figure, someone whose deep-hued nearly-surrealistic autobiography REALLY THE BLUES made a profound impression on me when my sister gave it to me as a birthday gift (I was, I think, 14). The dream of this century and the preceding one is “You can be anything you want to be if you only want it fiercely enough,” and Mezz — in his own way — exemplified that romantic notion. Mezz was a White Jewish Chicago kid (those identifiers are important to the story) who was so entranced by the Black music he heard that he knew that was what he wanted to play. More importantly, he knew that “that” was the person he wanted to be, the life he wanted to lead. 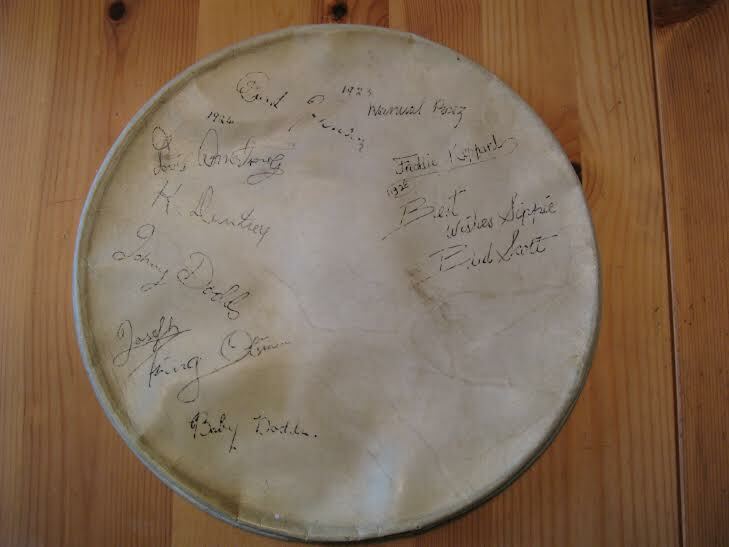 So, although he was never a great musician, he became a friend to Louis Armstrong, Sidney Bechet, Tommy Ladnier; he heard and hung around Bix, Joe Oliver, Baby Dodds, Dave Tough, and the rest. He organized record dates with Teddy Bunn, Bechet, Hot Lips Page, Chick Webb, Frank Newton, Willie “the Lion” Smith, Benny Carter, J.C. Higginbotham, Sidney Catlett, Art Hodes, George Wettling, Zutty Singleton, and more. He was deeply involved in a near-religious crusade to offer marijuana as a more healthy alternative to whiskey or hard drugs. And he crossed the color line early and without pretense. In an era when having mixed-race record sessions was rare, Mezzrow (like Eddie Condon) pushed this idea forward with historic results. 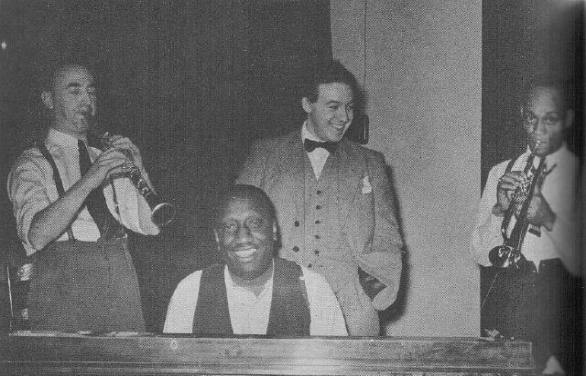 He led a band, the Disciples of Swing, where “white” and “colored” musicians played together. And more seriously, he identified as Black — marrying a woman of color, and taking his convictions into everyday life. I think (although I could be presuming here) that this latter figure — the man so deeply committed to a music and the ideas behind it: community, equality, creativity — is the man Spike honors by naming this new club MEZZROW. Here is the club’s website, where you can learn more about it — the schedule, ticketing, about Mezz himself, and more. I don’t know when I’ll make my first visit, but since I see my friends Rebecca Kilgore, Ehud Asherie, Rossano Sportiello, Michael Kanan, Scott Robinson, Neal Miner . . . I expect to be there often, and it may well be a deeply needed oasis of quiet creativity in New York. And https://www.facebook.com/mezzrowclub is the club’s Facebook page. I feel as if I’ve been listening to recorded music all my life, and the discs and tapes I’ve managed to acquire certainly testify to this. Long-time listeners like myself are also involuntary editors, revisers, and critics. Put on a new CD and we want to enjoy it wholly, but often the small whirring section of the brain that points out details comes in to play. “I’m so glad they are playing that song, but why at that tempo?” “Great band, but adding a trombone would have been even nicer.” “Did that soloist have to stop after one chorus?” You get the idea. We can’t help ourselves, and the Ideal Sound we hold in our heads — imagined, rarely heard — can be an awful burden. Thus, it’s a real pleasure to alert you to a new CD, so special that I could instantly tell the critical cortex to take a nap. It’s that good. I had heard and admired Steve for some years through recordings, but when I heard him in person for the first time last October at Duke Heitger’s Steamboat Stomp, I was even more impressed with his depth of feeling and immersion in the music. He doesn’t offer anything formulaic; he creates wonderful melodies and generous, leafy counterpoint; his pulse is always irresistible, even on a slow blues. Many capable players build little stylistic boxes and settle in for the duration: it could be their planned approach to the material, their choice of songs, the way they envision their bands. Steve is more a free-floating spirit, with his goal being to inhabit every song fully as its own musical performance. No artifice, nothing but a kind of light-hearted yet inense candor, which makes his work sing . . . even when he isn’t. What he creates isn’t “traditional” or “New Orleans” or “Dixieland” jazz — but swinging dance music with a new rhythm for every track. All of that would sound as if this were another Pistorius solo recital: rocking piano that bridges old traditions and new energies, and witty yet heartfelt singing of ballads, blues, naughty songs, and stomps. 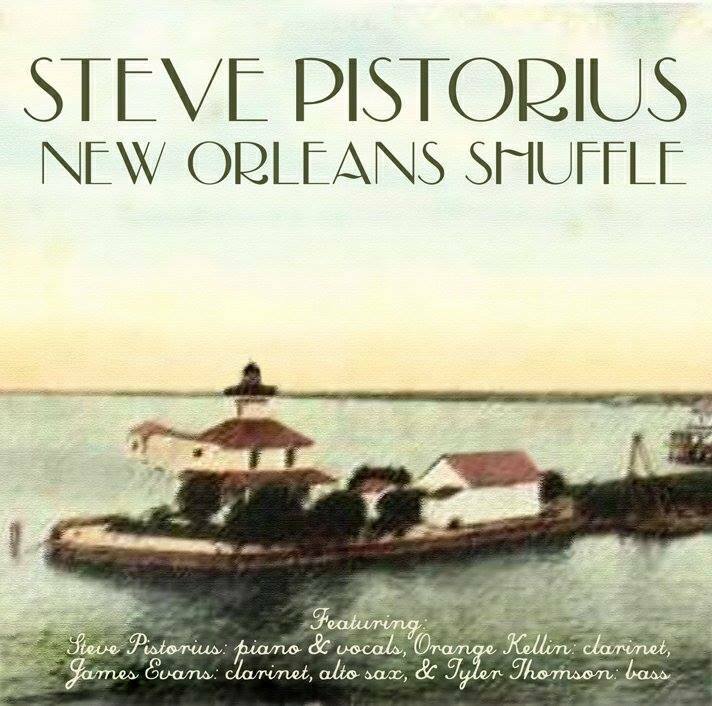 But there’s much more on NEW ORLEANS SHUFFLE, because it’s a quartet with Orange Kellin, clarinet; James Evans, clarinet and alto saxophone; Tyler Thomson, string bass. To the purists, that might seem like an incomplete band, but this quartet is richly fulfilling. They don’t strive to offer contemporary copies of anyone from the Apex Club Orchestra to Soprano Summit: they sound like four generous fellows having a wonderful time in an informal setting. Not the clamor of angry stellar jays fighting for primacy in a nearby tree; nothing shrill or loud, just communal fun in sweet exploration. The quartet neatly and surprisingly balances the rough, even raw possibilities of the clarinet with the elegance of the alto, and it’s all supported by Steve’s left hand and the buoyant playing of Thomson, a gifted player in the school of Pops Foster and Milt Hinton. I’ve always admired the fierce honesty of Orange Kellin’s playing: he plays like a man speaking his inmost thoughts — but those thoughts swing as they tumble out of him. James Evans is new to me, and he is also a fine clarinetist, but I was even more impressed by his honeyed alto playing — the way people who weren’t wooed away by Bird stuck to their original impulses about saxophone playing. The quartet is a model small community, where something engaging is always going on, players trading melody and improvisation, lead and counterpoint. And the beat goes on from the first note to the last. The repertoire is immensely delightful — songs by Bechet, Dodds, Tony Jackson, Jelly, Natty Dominique, Bill Whitmore, Joe Oliver, but also by Berlin, Carmichael, Lorenzo Barcelata, Albert Howard, and Paul Dresser — a far cry from the done-to-death songs that characterize “traditional” playing: NEW ORLEANS SHUFFLE / BABY, I’D LOVE TO STEAL YOU / DANS LES RUE D’ANTIBES / BECHET’S FANTASY / BULL FIDDLE BLUES ? WAITING AT THE END OF THE ROAD / WORKING MAN BLUES / MARIA ELENA / LADY LOVE / BLUE BLOOD BLUES / JUBILEE / AS TU LE CAFARD / TUCK ME TO SLEEP IN MY OLD ‘TUCKY HOME / GEORGIA CABIN / MY GAL SAL. Nicely recorded in several 2013 sessions. Honest, lively, feeling music. I wish this were a working and touring band, and that I had a whole sheaf of videos of it to share with you. But I don’t. You’ll have to trust me about just how good this disc is. To purchase a copy, please send $20 to the Man Himself (no rolls of quarters, please — check or IMO): Steve Pistorius, 306 Florida Boulevard, New Orleans, Louisiana 70124. And something better than the usual bills will soon be in your mailbox. “I guarantee it,” as Justin Wilson used to say. Be forewarned: the visual quality on the performance that follows is sub-standard, although you can get used to it. This is what much-transferred forty-years-old videotape looks like, but the audio is loud and clear. This video is a valuable document, because I don’t know of any other performance footage of cornetist Johnny Wiggs and clarinetist Raymond Burke — lyrical heroes of mine — here accompanied by Graham Stewart, trombone, Bob Greene, piano, Danny Barker, guitar, Freddie Moore, drums: Johnny Wiggs’ Bayou Stompers, introduced by Johnson “Fat Cat” McRee, sometime singer / kazooist and eternal jazz lover – festival creator. The song is elusive — TONY, LET THE MEATBALLS ROLL — and I couldn’t find any lyrics online, but the opening phrase so neatly fits the title that I am sure JAZZ LIVES readers can (silently) invent their own narratives with the proper scansion. I am amused by Raymond Burke’s endearing personal choreography — his body mirrors what he is playing more than is true with many players. And his tone is so singular, sweet-tart in the manner of Ed Hall — but you wouldn’t mistake one player for the other. A great underacknowledged poet of the clarinet. Wiggs continues to astonish. He saw Joe Oliver in New Orleans (I seem to remember this was 1919) and Oliver left a lasting impression. But then Wiggs heard Bix and those wandering odes took over — haunting but always mobile. I hear in Wiggs, who was 73 at the time of this video, a sweet, sad evocation of what Bix might have sounded like had he lived on this long. Wiggs’ music plunges forward while looking over its shoulder in a melancholy, ruminative way. And although Wiggs recorded early (1927) and from 1949 into the fifties, his late work fully expresses a kind of autumnal sensibility, delicate without being timid or maudlin — the sweet voice of an elder who has seen a great deal and knows that life is sadly finite but celebrates that life with his cornet. One other thing occurs to me, with special relevance to my own video efforts, where musicians justly want the performances that will be disseminated and preserved for posterity to be as free from flaws as possible. Anyone who watches this video to the end — and why wouldn’t you? — notices a small train wreck (with no one hurt) because the band is not clear whether to go on or stop. I find this, like Burke’s body language, quite endearing. I’d rather have imperfect Wiggs and Burke than know that this flawed performance had been consigned to the trash. This video — although I do not know the originator — comes to us through the loving diligence of trumpeter / archivist Joe Shepherd, Sflair on YouTube, someone who cares a great deal for and about this music. Thank you, Joe! Posted in "Thanks A Million", Awful Sad, Bliss!, Generosities, Ideal Places, Irreplaceable, Jazz Titans, Pay Attention!, Swing You Cats!, That Was Fun!, The Heroes Among Us, The Real Thing, The Things We Love, Wow!